This Christmas you shall go to the most magical pantomime of them all, Cinderella ! Starring soapstar Jessie Wallace, the famous rags-to-riches story will be brought magically to life in a sumptuous production which carries the White Rock Theatre’s hallmark of quality entertainment for all ages, stunning sets, outrageous costumes, and that most magical pantomime moment when Cinderella is transported to the Prince’s Ball with the help of a pumpkin, some mice and lots of Fairy Godmother magic! Book today or even your Fairy Godmother won’t be able to magic you the best seats in the theatre. ** The family package is four tickets (two adults and two under 16). A £1.00 per ticket booking fee applies, capped at six per order. Fee-Free booking for White Rock Friends. Over 60, under 16 and registered disabled. *Relaxed performance. Designed to welcome people with an autistic spectrum condition, learning disability or sensory and communication disorder. In aid of this, The White Rock Theatre we have provided a VISUAL STORY, please click to download. 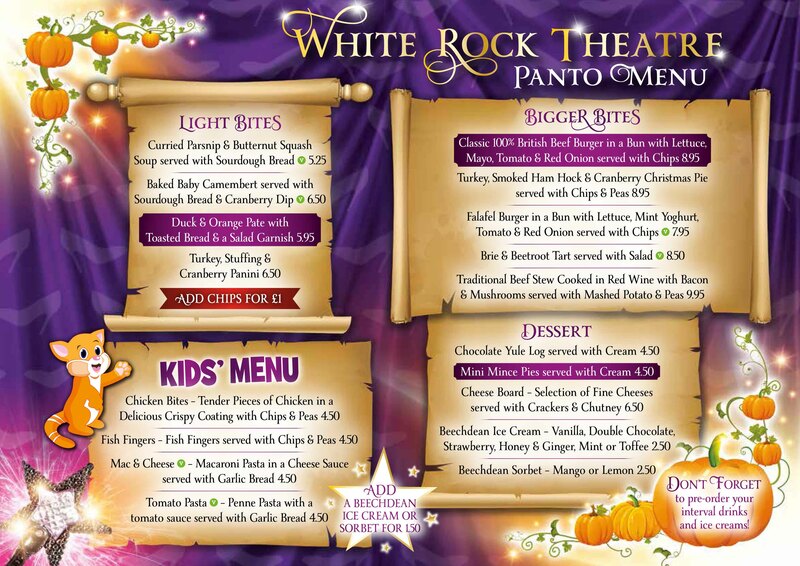 Check out our tasty panto menu below and pre dine with us before the show.